On 20 June, Belarus signed a contract with the Russian Irkut corporation to purchase 12 Su-30SM fighter jets for $600m. This would be the largest ever arms deal between Minsk and Moscow. Earlier in June, Minsk also received its first batch of T-72 tanks, which were modernised in Russia. At first glance, Russia seems to be arming Minsk. This fits with conjectures that the Kremlin is becoming increasingly hawkish and Minsk and Moscow are colluding to put their regional and Western opponents under pressure. However, a more scrupulous analysis of such arms deals, as well as the armaments the Belarusian army possesses, paints a different picture. Moscow refuses to bolster the steadily declining Belarusian military's capacity to conduct offensive operations, including joint large-scale operations with Russia. Does the Kremlin really want to arm Belarus? Meanwhile, even Belvpo.com, a media outlet with probable (close) links to the Belarusian army, has repeatedly criticised Russia's policy regarding weapons for Minsk over the past several months. One of the publication's authors, Valery Berazhnoi, recently lashed out at the Kremlin for refusing to supply Minsk with S-400 surface-to-air (SAM) systems and Iskander tactical ballistic missile systems. He noted that Russia had already given S-400s to China and Iskanders to Armenia. For almost ten years, Belarusians were given promises [of receiving Iskanders]. Thus, in cooperation with the Chinese, the Belarusian defence industry created a fundamentally new type of weapon – the Palanez rocket system [because they could not get Iskanders]. These are harsh words coming from a publication which is neither oppositional nor nationalist, but produced by retired Belarusian army officers. The facts also point to Moscow's reluctance to provide Minsk with arms. Lukashenka's and Putin's failure to boost Belarus's offensive military capacities becomes obvious after a brief analysis of which weapons the Belarusian army has received and decommissioned over the past several years. On 20 June, the Moscow-based business daily Vedomosti explained that Russian loans would be used to finance the forthcoming deliveries of Su-30. In order to make it easier for the Belarusian budget, the Russian manufacturer would deliver about four aircraft a year. Tut.by also reports that the contract had been concluded directly, i.e., without the mediation of the Russian government. In other words, the Kremlin is in no haste to arm Minsk; Belarus must purchase arms like any other country. This seems to be a pattern. Last October, Lukashenka revealed the conditions on which Minsk had bought the S-300 SAM systems to the Belarusian parliament: 'To my knowledge, we paid $170m, took the S-300s, repaired them, modernised them, and deployed them.' In other words, Minsk paid Russia even for second-hand S-300PS – despite the fact that the Kremlin could hardly have sold them at a decent price anywhere. The Belarusian army will not enlarge its air force by adding the new Su-30SMs to it. According to then deputy defence minister Ihar Latsyankou in February 2016, it will use the new jets to replace currently active MiG-29s, which Belarus inherited from Soviet times. Minsk is already looking to sell its MiGs. On 29 June, the Russian military analysis blog BMPD, citing an anonymous Serbian source, reported that although Serbia has currently stopped negotiating the purchase of eight MiG-29s from Belarus, it could conclude the deal in 2018 or later. A similar situation exists regarding combat helicopters. On 25 June, Russian military aviation blogger kloch4 published an abusive but noteworthy analysis of Minsk's plans to decommission its Mi-24 attack helicopters and sell them abroad. …we can confirm a sharp weakening of the Mi-24 fleet in Belarus – there are only a dozen flying vehicles, some of them – the Mi-24 of non-attack modifications which cannot employ guided anti-tank weapons. The choppers of the latter kind have recently been returned to service, which indicates a certain armaments crisis … There were no attempts noticed to modernise the equipment in order to increase its combat capacities, including for night missions. Its no wonder that on 10 June, the French daily Le Figaro quoted a UN Security Council document saying that the Mi-24 attack helicopters recently seen at airfields controlled by Libya's Tobruk-based government had been purchased from Belarus. The UAE had bought them for its Libyan allies. The Emirati government has been buying military equipment for its Libyan friends for some years: in 2014, it purchased four Mi-24V attack helicopter from Belarus for Libya. Le Figaro's report might indicate that there were further such deals. The Belarusian army's attack helicopters are in even more dire straights than its fighter jets. Unlike fighter jets, which are partly being replaced by newer airplanes, Minsk has no such policy for its attack helicopters. It did not buy any new combat helicopters from Russia – only 18 Mi-17V5 transport helicopters. This is an odd choice for a country preparing for a clash with NATO. What's more, there are no new tanks coming from Russia to strengthen Minsk's military might either. On 2 June, the Belarusian army received its first batch of T-72B3 tanks from the Russian plant Uralvagonzavod. The T-72B3 model is the latest Russian modification (as of 2016) of the Soviet mass-produced T-72 tank. As great as this might sound, this makes little difference for Belarus's offensive capacities. First, Minsk received only four tanks, even though the Belarusian defence ministry subsequently signed a contract with the Russian firm on modernising another batch of T-72s. Secondly, the Russians are modernising Belarus's own T-72s. They are not providing new machines, not even T-90s, which have been deployed by the Russian army for many years already. The same can also be said about other types of armoured vehicles. Thus, contrary to claims by some Russian military analysts, Minsk has abandoned its plans to buy new Russian BTR-82As, an armoured personnel carrier. What's more, for several years Belarus has been receiving lighter armoured vehicles of the Humvee-type not from Russia, but from China – and for free. In sum, an analysis of Belarusian military hardware purchases and sales does not seem to indicate any preparation for large-scale operations involving Belarusian participation, such as a Russian invasion of the Suwalki gap to reach the Kaliningrad Province or indeed anything larger than counterinsurgency missions. Moreover, Belarus still retains its brigade-based army structure – which it adopted for smaller operations – while since 2014 Russian has been reestablishing larger units – divisions and even armies – suitable for fighting large-scale wars. Is Minsk just out of money? Perhaps, but Russia is not demonstrating any willingness to boost the combat capacities of its Belarusian ally for such deployments by supplying it with appropriate weapons. The only new equipment Belarus received from Moscow over the last five years was trainer jets and transport helicopters, with Tor-M2 SAM systems being the largest Russian contribution to Belarusian defence. And Minsk paid for them. Thus, it is clear that if Russia has any plans for larger offensive operations, the Belarusian armed forces have no place in them. The first Belarusian Palanez MLRS with its tactical ballistic missile. Image: Siarhei Leskiec, Belarus Digest. On 20-22 May, Milex-2017, an exhibition of defence equipment, took place in Minsk. It featured the first Belarusian ballistic missile. This recent success was one of many for the Belarusian defence industry. On 18 May, the Chairman of the State Military Industrial Committee of Belarus, Siarhei Hurulyou, announced that from 2011 to 2016 the defence enterprises supervised by his committee had almost doubled their export volume, earning about $1bn last year. These two stories illustrate two different paths the Belarusian arms industry is taking. On one hand, they still earn a considerable portion of their money by cooperating with Russia. On the other, they are diversifying and developing products by working with China, Ukraine, Azerbaijan, and many other countries – even going so far as to annoy the Kremlin. Speaking at Milex-2017 on 20 May, Hurulyou stressed that Russia remains Belarus's principal partner, 'which nevertheless is somewhat nervous and, well, maybe also glad about our successes.' He also mentioned China and South East Asian nations as other important partners. Belarus could hardly have earned a $1bn last year without Russia's involvement. This is obvious given known deals, as well as those reported in the media in recent months. The largest deals which did not involve Russia are novelties for the industry: including deals on air defence equipment and related services with Vietnam, Myanmar, and Azerbaijan. For instance, an improved version of the Vostok-E radar, which once helped Iran intercept a US drone, has been developed together with Vietnam. Furthermore, Belarus sold the armoured vehicle Bars and the Belarusian-Ukrainian anti-tank missile Karakal to Turkmenistan. Minsk also made other minor deals such as selling Poland munition for $7.7m in 2015. Nevertheless, these deals alone cannot explain the dramatic growth in Belarusian defence export. Deals on military aircraft and their servicing bring in much more money: the 558th Aircraft Repair Works in the city of Baranavichy conducts overhaul and modernisation of helicopters and aircraft. Last year, it signed a contract to overhaul twelve Su-25 aircraft for Kazakhstan. Concurrently, it is also completing the overhaul and modernisation of the second-hand Su-30K jets which Russia promised to Angola. The latter contract generates at least as much income as the deal with Kazakhstan. Belarusian defence industries make the most money not by producing complete systems, but by making components for the systems manufactured by others, especially Russia. The most notable of these include chassis from the Minsk-based factory MZKT. The Russian tactical ballistic missile system Iskander, some S-400 surface-to-air missile systems' parts, and the mobile coastal defence missile systems Bastion, Bal-E, and Bereg all operate on MZKT-7930 chassis. Belarusian sight devices are installed on various Russian anti-tank systems, including the T-90, T-72, and T-80 tanks and infantry fighting vehicles. Russian defence industries also use Belarusian fire control systems on various armoured vehicles. Likewise, Belarusian firms supply electronic warfare and some avionics; these are installed not only on modernised Su-27 but also on the most advanced Russian fighter aircraft Sukhoi PAK FA (T-50). No wonder the Belarusian defence industries have succeeded in earning more money thanks to the massive modernisation of the Russian army in recent years, which also necessitated replacing certain Ukrainian components in Russian-manufactured equipment. 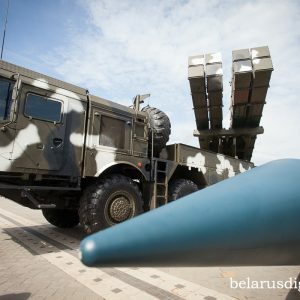 Missiles and armoured vehicles: How Belarusian are they? Minsk, however, realises that these tailwinds can change, and is struggling to diversify. The most remarkable new products presented in the Milex-2017 included a new missile for Palanez and an armoured vehicle called Kaiman. Both of them were results of attempts to develop technological branches that had been either non-existent – like missiles systems – or underdeveloped, like armoured vehicles. A mock-up of a tactical ballistic missile has attracted arguably the most media attention at the exhibition. It will make recently deployed Palanez Belarus-Chinese multiple-launch rocket system (MLRS) capable of delivering a conventional 560 kg payload as far as 300 km. Now, the Palanez shoots only at 200 km with much smaller rockets. The Belarusian State Military Industrial Committee admits that the missile was designed under the framework of 'existing cooperation'. This formulation seemingly indicates collaboration with China. Experts at the Moscow-based Centre for Analysis of Strategies and Technologies dismiss it as a version of the Chinese missile M20. However, experts have suspected for years that Ukrainian firms may also be involved. Besides missiles, the Belarusian government has been striving to produce mechanised armoured vehicles in the country. The new combat reconnaissance/patrol vehicle Kayman became one of the most celebrated products at the Milex. It was designed by the 140th Tank Repair Works based in the city of Barysau. The first models of Kayman were produced based on the Soviet BRDM-2, an armoured patrol car. However, the Works' head designer Volha Pyatrova insist that the final version of Kayman is an original product manufactured mostly from Belarusian components. President Lukashenka ordered the design of such a vehicle three years ago. This month, Kayman was officially deployed in the Belarusian armed forces. Does Minsk supply dysfunctional equipment? Belarusian defence industries have so far succeeded in maintaining a certain degree of quality in their international cooperation. But on 17 May, the radical opposition web-site Belorusskii Partizan published material about allegedly dysfunctional military equipment supplied by Belarus to Azerbaijan in the early 2010s. Some Ukrainian components in the supplied systems reportedly were broken; furthermore, Belarusian firms perhaps paid Ukraine too much. Numerous foreign media sources, such as the major Azerbaijani media outlet Haqqin, quoted the article. However, there is little evidence of the problems described by Belorusskii Partizan, which was the only source of information on the case. It claims to possess copies of documents proving the story but it has refused to publish them so far. This is not the only unsubstantiated story about the Belarusian arms industries to circulate recently. On 26 April, the French bulletin Intelligence Online published an article accusing Lukashenka's government of continuing arms trade with the Syrian government. The bulletin based its story on a meeting between Belarusian Industry Minister Vitali Vouk and Syrian prime minister Imad Khamis. Official reports, however, do not indicate that they discussed military matters. Belarus has avoided supplying sensitive items to Damascus for years, and the 76-word story failed to provide any evidence that the opposite is now true. Defence industries constitute an important branch of the Belarusian economy. They are dynamic, willing to introduce new products, and diversify markets and partners. Belarusian defence firms remain closely linked to Russia, but that does not mean they are dependent on it. They are looking for autonomous ways to export their defence products. This certainly angers the Kremlin. Unsubstantiated stories which work to undermine cooperation with Ukraine and Azerbaijan are just more proof of this.